Windows Hello enables different types of biometric sign-in: fingerprint, iris, facial or voice recognition. 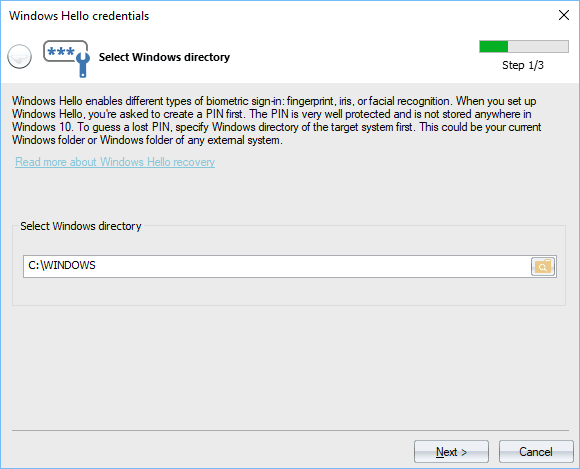 When you set up Windows Hello, you're asked to create a PIN first. The PIN is very well protected and is not stored anywhere in Windows 10. However, it can easily be decrypted in Windows 8. To guess a lost PIN, you should specify Windows directory of the target system first. This could be your current Windows folder or Windows folder of an external system. To provide PIN synchronization for all devices, Microsoft keeps the copy of your PIN on its servers (for Microsoft accounts only). Show the Windows directory of the target system first. In order to be able to extract a PIN, the Windows directory should allow access change or file write operations. In case you have set your current Windows folder, it is enough to run the program with Administrator privileges. On this step, the program shows all found user accounts that have been set to use a PIN to logon into the system. 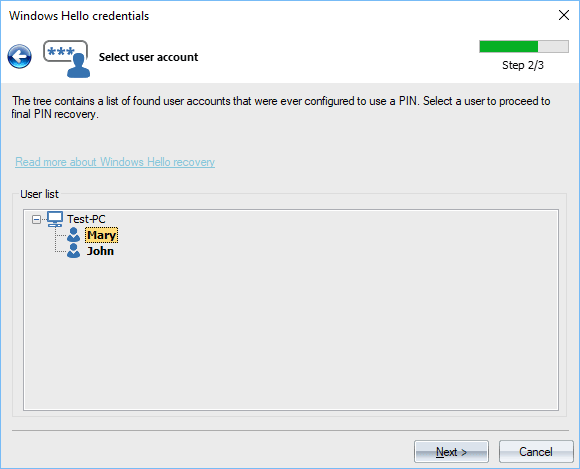 Just select a user and proceed to the PIN recovery dialog. 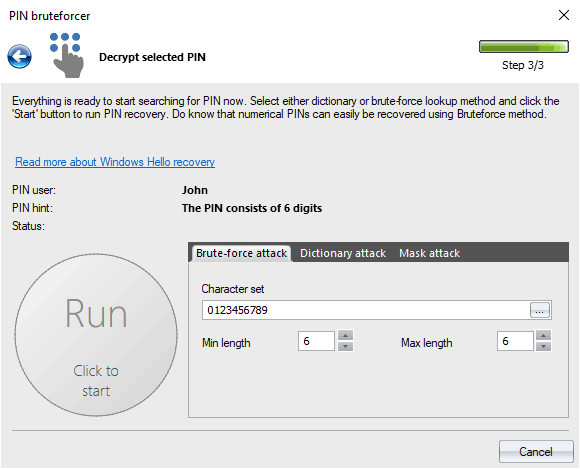 The program supports two recovery methods: brute-force and dictionary guess. Settings for each one are rather trivial. In case of brute-force, you will need to set up a character set, as well as minimal and maximal PIN length. For a dictionary attack, just set up a word-list and select the word mutation level required. To run or stop the attack, use the round button to the left of the settings. In certain cases, the program can detect the character set used to create a PIN. If this is your case, the hint should appear in the corresponding field.